Jurgen Strohmayer is an architect studying in the masterclass of Greg Lynn at the University of Applied Arts Vienna. Here he speaks about his performance "will you come back tomorrow?" as part of “Guabuliga – Well by the Thorn Tree” , a multidisciplinary project that focuses on spatial phenomena in Guabuliga, Ghana. After a four-week stay in February 2012, parts of the group’s growth strategies and artistic interests will be implemented in a trip in September 2012. Embedded in the rolling hills of the Guinea tree savannah ecological region and the Volta River system, a telecom tower pierces the sky where two unpaved roads meet. It’s the end of the dry season in February and the Harmattan still sweeps sand across the orange stone formations and riverbed valley where hunters settled near a well a hundred years ago. 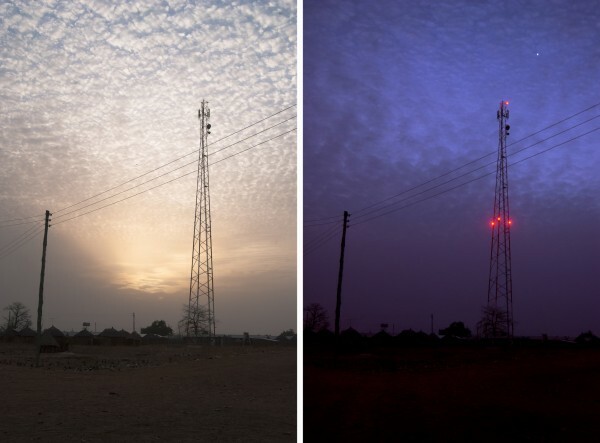 The plasticity of the location is sharpened by the contrast between the sand-filled celestial dome and the needle-like metal frame of the telecom tower that was erected along with hundreds of pylons by network companies across Ghana. As the sun sets, the static red lights of the trussed tower appear above as the roadside TV’s continuous ramble picks up the fading football game cries on the ground. As we prepare for dinner we invite a few more people to join us in our compound, an aggregation of four huts surrounding a shared courtyard. Our stay in Guabuliga could be narrated by these exchanges. My work will you come back tomorrow? is part of an ongoing, multidisciplinary engagement with Guabuliga, a farming village in northern Ghana. As part of a collective of four architects, a landscape architect and a water management engineer, we were commissioned by the chief of Guabuliga to propose growth strategies for the village. Provoked by the spatial manifestations of relational currents that bind Guabuliga to an intimate network of economic and cultural trends, the photo shoot I staged on a sandy football pitch one evening became part of a process to revise our initial Romanticisms of this geographically remote village. While adobe huts set against a backdrop of figurative baobab trees and gusts of red sand dominate the daytime imagery of Guabuliga, night time refocuses activities, inverting the village panorama to feel almost urban. Light is emitted from various screens in compounds and “drinking spots” alongside the dirt roads that attract groups of people in the early evening to watch football games and Nollywood episodic dramas – imports from English-speaking Nigeria and recently the more developed south of Ghana. Loud rave music is projected across the village from dance parties that last all night, silenced only by the muezzin’s first call to prayer before sunrise. Above this, four red lights hover on the panoptical telecom tower that marks one of the gravitational centres of the otherwise flat village. Faced with these rough cultural seams running through Guabuliga, my aim at the time was to highlight the “transcultural proximity” (1) that I saw through the manifestations of global and regional phenomena in what seemed a geographically defined location. I worked with Ghanaian performance artist Bernard Akoi-Jackson and architect Baerbel Mueller on developing a performative event inspired by prior observations and visual studies of the many interweaving trends and seams running across this place. My goal was to transport images of Guabuliga that visualized the folds and seams of a contemporary life in this extremely specific place. I invited five young men and women to dress up and be photographed in front of an assembled stage that incorporated iconic, everyday items brought into the village by regional trends: Made-in-China plastic chairs, polyester sleeping mats with undecipherable patterns, a woven carpet of plastic bags that coloured the set with the whites, blacks, and pastels that are as present in the village as the orange savannah sand.